It’s a video with a few Saudi kids hanging out from the doors of their car in a highway, making it look like they are “skating” at over 100kmph. A Germany show called Galileo which is apparently a German “mythbusters” tried to check if it’s true or fake. 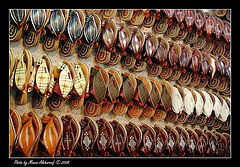 They used different shoes but they never tried the Saudi sandals also known as “Zobairiah”. Just please don’t try this … at home or anywhere! First Try: At 60 km/h Mathias tries to get out of the car. Even with heavy airstream he’s able to open the door. The inline skates get quite unsettled. Galileo says many passersby think the video is a trick. They believe the sandals in the video have small rolls which kids do often have under their shoes too. Second Try: He says it’s quite hard to get on the shoes. Once he gets on the asphalt with the front of the shoe there’s a heavy resistance which brings him and the shoes out of control. Conclusion: There’s no real conclusion at the end except the fact that they weren’t able to do the same kind of surfing with all those shoes.